Credit goes to: @Destined4Scotty for all the following videos! Thank you so much for sharing your videos with all of us here at Fansofscotty. The Ryman Auditorium Fri., 12/07/2012 7:00 p.m. Even though their website shows Scotty is scheduled for December 7th & 8th the agent said Scotty will not be appearing on Saturday, Dec. 8 -- either 7:00 or 9:30 pm. Scotty McCreery performs "Take Me Out to the Ball Game" at the Durham Bulls Athletic Park during the Triple-A National Championship Game. Click on the link below to see pictures of Scotty from his Celebrate My Drive Live interview. 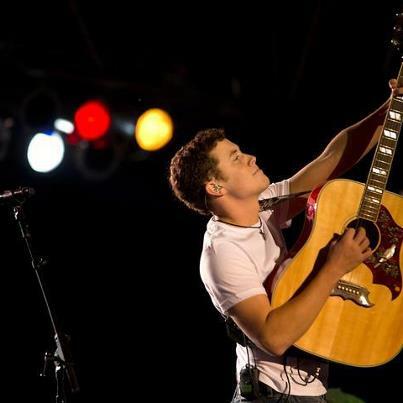 Scotty McCreery was in the house Friday night at The Great Frederick Fair. The screams of teenage girls, homemade signs that read "We Love You Scotty!" and a baritone voice deeper than your typical 18-year-old male college freshman confirmed it. Before the "American Idol" winner took the stage, his fans were taking photos in front of the stage, chattering and waiting in line to buy T-shirts and photos and to go backstage for a meet-and-greet. Jessica Hoops, 17, of Manchester, was first in line outside the grandstand, waiting for the doors to open. She won a pair of track seat tickets to the show from radio station WFRE and brought her best friend, Alexandra Smith, 17, of Manchester. The two met in Spanish class at Manchester Valley High School and learned they were both big McCreery fans, Alexandra said. "She's a really big fan," Alexandra said of Jessica. "I do love his eyes," Jessica said. She was wearing a McCreery tour shirt she bought when he played a show in Baltimore with Brad Paisley. On her bedroom walls, she said, are two McCreery posters. When McCreery was an "Idol" contestant, she voted for him "over and over." "As soon as I saw his audition, I melted," Jessica said. Her favorite McCreery song is "You Make That Look Good." Carly Wood, 13, and her mother, Michelle Wood, of Friendship, said they were "kind of even" when asked who's the bigger McCreery fan. Carly said she was hooked the first time she heard him sing during the auditions on "Idol." -- "I like his deep voice, his humbleness and niceness," Carly said. "His blue eyes are so pretty, and I like the cross (necklace) he wears." Her mom said she thinks McCreery is a good role model for kids his age. Carly and her mom traveled to McCreery's hometown of Garner, N.C., to watch him play his last high school baseball game. Carly made a poster and McCreery autographed it after the game. She made two more posters for the concert. One read "Forever (heart) 8." Eight was McCreery's uniform number. 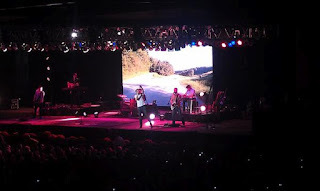 Wearing a white T-shirt, jeans, boots and his signature cross necklace, McCreery opened his set with "Walk in the Country," from his debut album. Videos and images flashed on the screen behind him throughout the set, including the videos he's made for the singles released from the album. McCreery played the acoustic guitar for the second song, "You Make That Look Good." "How y'all doin' tonight in Maryland?" he asked. Hundreds of girls screamed in reply. That would continue throughout the concert. Screams, screams and screams. The 15-song set included other songs from his album, "I Love You This Big," "Write My Number on Your Hand" and "King James Bible." "I want to include one faith-based song on my albums," McCreery said of the Bible song. "I wouldn't be here without my faith." He also did covers of George Strait, John Michael Montgomery, Garth Brooks, Travis Tritt and Elvis Presley, noting that when he was a boy he was the weird one listening to Elvis songs when everyone else was listening to the Backstreet Boys. McCreery also sang a little bluegrass with "Man of Constant Sorrow." -- "One of the reasons I love to come to Maryland is ... the girls. Y'all are special here," he said before singing one of his hits, "The Trouble With Girls." Ater leaving the stage at the end of the set, McCreery and his band returned for an encore, a rousing rendition of the Montgomery Gentry hit "Gone." With Keith Urban official named as a judge for season 12 of FOX’s “American Idol,” season 10 winner Scotty McCreery says it’s “about time” the show got a judge from the world of country music. Urban is already on the road judging “Idol” contestants around the country, and viewers will get their first glimpse of him at work when the show debuts in January 2013. He joins fellow judges Randy Jackson, Mariah Carey and Nicki Minaj. Click on the link below & it will take you to their newsletter webpage, then you click on the Summer 2012 link beside the article with Scotty's picture on the front. Then put your mouse on the pictures and click the pages will automatically change & Scotty's story is on the 4th page. For all the fans wondering how the pre-sales were going on Scotty's Christmas CD, this is what Mike tweeted to a fan last night. “@SportyforScotty: How’s Scotty doing on signing those CD’s? Plenty left to do! Good news is CWSM had more than double the preorders as CAD! Trying to get a Scotty McCreery glimpse after this evening's concert at the 150th GREAT Frederick Fair! Pumped about the show tonight in Frederick, MD! Yall come on out. Were adding something pretty big to the show tonight! Take a close look at the picture that was tweeted from last nights concert & you will see what Scotty was referring to in his tweet. Looks like our favorite NC singer has added some video background to his solo concert!!! !